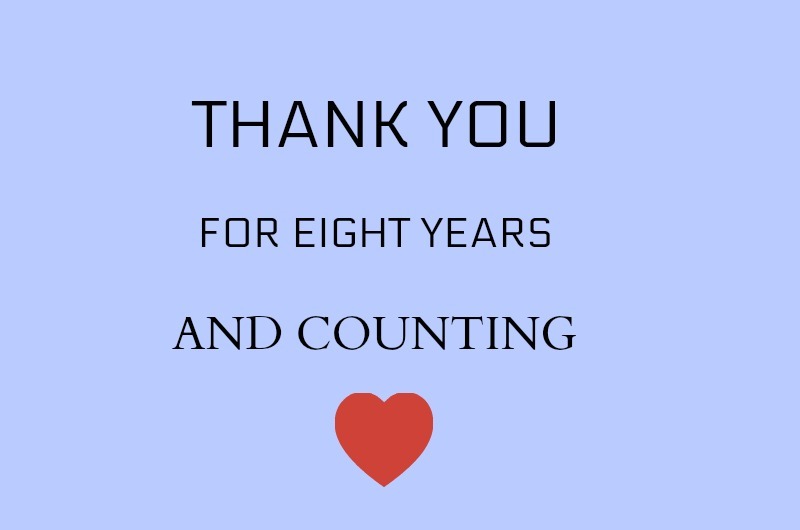 I can't believe that today marks eight years of blogging! I started this blog as a creative outlet since obviously I like to change things up in my home frequently. You can read my very first post here that explains why I started this blogging journey and be sure to ignore the quality of the photos. Blogging has changed so much since I started eight years ago and there are so many more blogs now. I'm sure I only read a handful. For those of you who continue to come read my blog and for the newcomers, thank you. Some bloggers have stopped blogging and I'm not sure how long I will continue and seriously had no idea I would be doing it this long, but for now I'm going to keep sharing my home, ideas and inspiration and I hope y'all continue to follow along because without you there is no blog. I get lots of emails asking me mostly home design questions or asking where I got something and I love answering those. Of course I love your comments on the posts, too. here's to eight years and counting! WOW! I followed you on Rate My Space and then found your blog while searching for a pic of your sunroom. I subscribed by email and have been hooked ever since! I look forward to your posts and all the beautiful inspiration you share! Happy Anniversary!!! Wow, Robyn, you go all the way back! Thanks for staying with me. Yours is one of the first blogs I ever read, and I continue to this day. I still want you to decorate my place. I love your taste. Janette, you are too kind and you decorate beautifully yourself. Congratulations! That adds up to a whole lot of ideas! Yes, it sure does. Thanks! Kim your blog is always a fun stop. I wish I had you close to come rearrange my house!! Oh, Cindy, I know you are kidding. You are a fabulous designer. Thanks so much! Congrats on a great 8 years....thanks for all of the inspiration and friendship!!!! Kim, I discovered your blog through Pinterest . Congrats on 8 wonderful years and thank you for all the inspiration! Thanks, Pam and you are always so kind to leave comments almost daily! Congrats, Kim! Your blog continues to be an inspiration!! Congrats on your anniversary! I found you shortly after you started blogging and you continue to inspire me! Happy 8 yrs. of sharing your home with us. I have been following your blog the past 7 years. Your home is ever changing beautiful. My favorite room has been your sunroom no matter it’s decor and colors. Blessings to you and your family. Congratulations, Kim! I love your blog and it was the first I ever followed. When I saw that you are in Georgia, that made it even better. I live in NC with a sister in law in Alpharetta, so it is nice to be able to relate weather, geography, etc. Your home is beautiful and believable! Keep inspiring all of us faithful followers! Wow! I had no idea you did rate my space! I know another blogger who was popular there. I never followed that site, so greek to me! LOL I have not been here since you started and cannot remember how I found your blog, but I enjoy visiting you and your home. Happy Blogiversary! I remember when you first starting blogging Kim. I have enjoyed watching you and your blog evolve over the years. I feel blessed to have met you in person and hope that we can get together again sometime. I've been a reader for many of those years and hope you continue for awhile! Your blog is still interesting and inspiring! I remember your first post! It was lovely! I don’t always comment, but I’m reading! You have a wonderful gift, and I am glad you share your talents. Congratulations! Enjoy seeing how you arrange things in your house. Congrats! I think I started following you in the first or possibly second year. And when I periodically cut back on blogs to read you always make the cut. Have enjoyed your ideas, talents and Miss Bailey. Thank you for sharing and hope you have many years left in blogland. Congratulations! IT has been a pleasure to follow along with you on your adventures. Congratulations on your 8 years of blogging. Hopefully there will be many more. Beside the fact you are such a kind and lovely person, you are so generous to share all your sources. Thank you. Bless you. I'll be with you til you grow weary. Happy Anniversary. Congratulations. For 8 years of continual inspiration! Always a joy to see what you are up to. I've followed you for a few years. I really enjoy all that you do. I think a room looks beautiful and the next change you make is even more beautiful! Magical! Thanks so much for sharing your talents. Happy Anniversary! I remember reading your first post!!! And I remember thinking, man oh man..I would never take on the gorgeous chest!! Alot of work to be done there and then being amazed at your after shots!! Kim, yours is the first of a handful of blogs I read. I used to read more however I don't really need to know how to make a mirror out of a cereal box or be sold something I couldn't possibly need. What I love about your blog is its authenticity. You appear to enjoy the ride as much as your readers do. I love how you answer our questions even if repetitive and your generosity with information. Most of all I love your style and the gorgeous Miss Bailey friendly home which although difficult to replicate in the tropical north of Aus, is inspirational. I painted my first sideboard because of you! I truly hope you continue to blog for some time yet. All the best. Congrats to you and hopefully you have eight more to go. Happy Anniversary, Kim. I think I've been following you since the begining. I started blogging in 2009. Like you, I started as a creative outlet. I'm less and less motivated these days. It's so time consuming, but I continue because of all the friendships that I've made across the world of bloggers. Thanks for sharing all these years. I much enjoy your blog and seeing your lovely home. So blessed by your willingness to share your talents! Congratulations on all the years! LOVE your ideas and shared beauty!! You are a natural talent and much admired!! Thank you, Lynn and for the Euro shams which are normally 26 inches I use the 26 inch insert. I use down filled inserts. You can also go two inches bigger with the insert when using down and it will be a bit fuller. With my throw pillows I usually stay the same size as the cover or go to the next size up. They normally run in two inch increments. 18, 20, 22, 24, 26, etc. Thank You. Do you usually order online? Any special place you like? I ordered 2 pillows from Society 6 and quickly realized that storage would be a problem hence all the insert questions. I order a lot on line. I mostly order pillow covers so I don't have a lot of inserts taking up space. I usually shop Potter Barn, and Etsy shops for covers. I also buy from HomeGoods when I'm out shopping if I find something. Happy Anniversary, eight wonderful years! I found you on Pinterest and was immediately excited to read you next blog. I have not been a regular. After four spinal surgeries I will be keeping an eye on you in the future. I love the style of your home and the love you add to it and your sharing all of that with your friends. Best Wishes for another Great Eight! Love Nancy.